Dear Santa, I made you some cookies. They’re soft, richly flavored with molasses, sweetened with brown sugar, full of delicious holiday spices, and a secret ingredient that make them a little bit healthier without sacrificing all the love and holiday joy that you would want in a delicious gingerbread cookie. P.S. 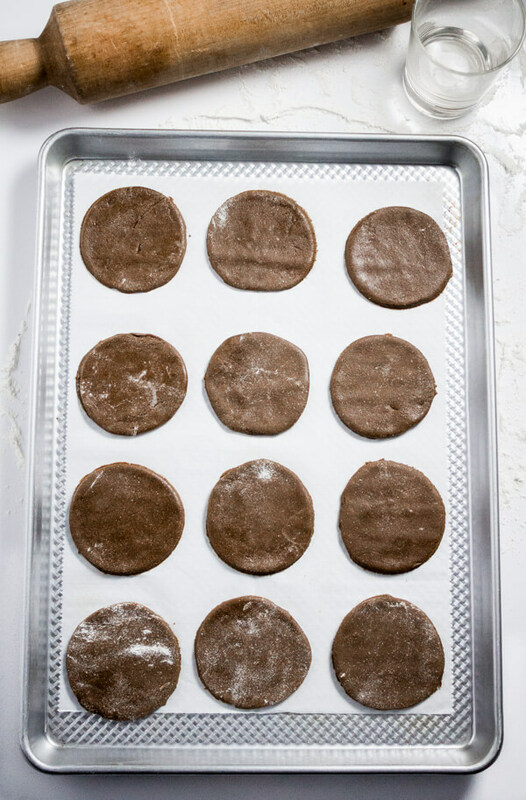 –> I noticed that the belt around your waistline was looking a little snug so I thought I would help you out by rockin’ an amazing gluten free cookie without using shortening or butter. Which in my opinion, gives you more freedom to slather on a little more of the cream cheese frosting. And no…the frosting isn’t a little healthier. Just the cookie. I do leave room for indulgence. Especially during the holidays. Would you like to know about the secret ingredient??? If I told you my dear, sweet grandma who this recipe originated from might look down on me from Heaven and give me the stink eye. But maybe not. I don’t think you’re allowed to give the stink eye in Heaven. So you know how back in the day (think like two decades ago) every pantry had a container of vegetable shortening in it? No, no, NO…the secret ingredient is not Crisco. Anyways…back in the day, before I started worrying about how many grey hairs were beginning to gather on top of my head and was counting the ones on my grandma’s head instead, everyone used Crisco. Like EVERYONE. Until we learned about trans fats and partially hydrogenated oils. Do you remember this? Santa, you definitely remember this, cuz your grey hairs have been around so long they are now pure white. 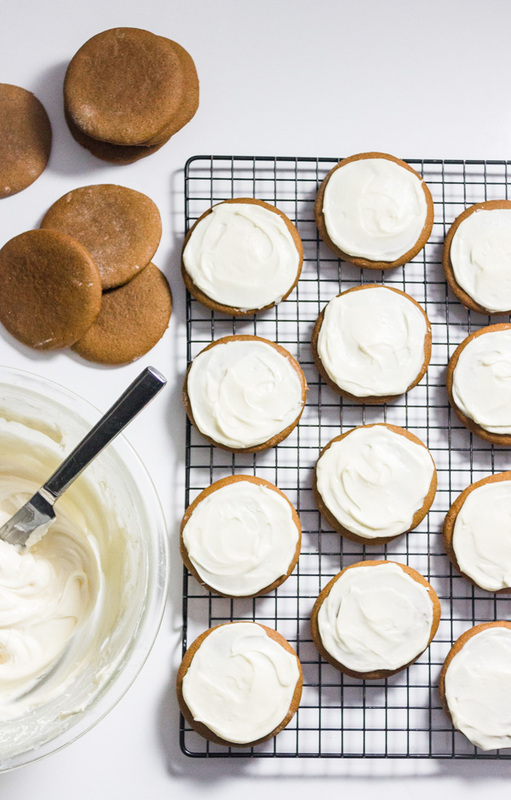 Here, have another gingerbread cookie with cream cheese frosting. My grandma’s cookie recipe used vegetable shortening. But I just can’t do it. Honestly, Crisco kind of weirds me out. How do they make that thick white-ish stuff out of those poor vegetables?!? But OOOhhhh how I loved grandma’s gingerbread cookies as a kid. It was always a long drive to my grandma’s house but you could always count on being smacked in the nostrils by all the amazing cookie smells when you walked in her house and a plate of cookies to be had, and then to be secretly had again when parents weren’t looking. Basically I think grandmas are synonymous with cookies. And grandpas too. But they do more of the eating than the baking. At least in my family. So here’s the deal with these cookies. Because I know you’ve been waiting for the big secret ingredient reveal. Let’s talk about gluten free some more -> Even though these baked beauties are gf they do NOT taste like cardboard. No dry, tasteless, crumbly cookies on this blog! I don’t eat cardboard. It’s called Pass Me Some Tasty. NOT Pass Me Some Cardboard. Let’s just be clear on that. And if you still don’t want to eat a gluten free cookie because for some reason it feels scary, just sub regular all-purpose flour. I won’t judge. But your gut might. Okay, are you ready for it??? –> I use light olive oil in these cookies. That’s the secret ingredient. Did that feel a little anti-climactic? Sorry. But seriously, I am so full of glittery glee and holiday merriment over how these cookies turned out by using light olive oil instead of shortening or even butter. They taste awesome. Which is the opposite of cardboard. I promise. Save the cardboard for wrapping up your presents. Don’t forget about the frosting. Like we could even forget about the frosting. Pssh. 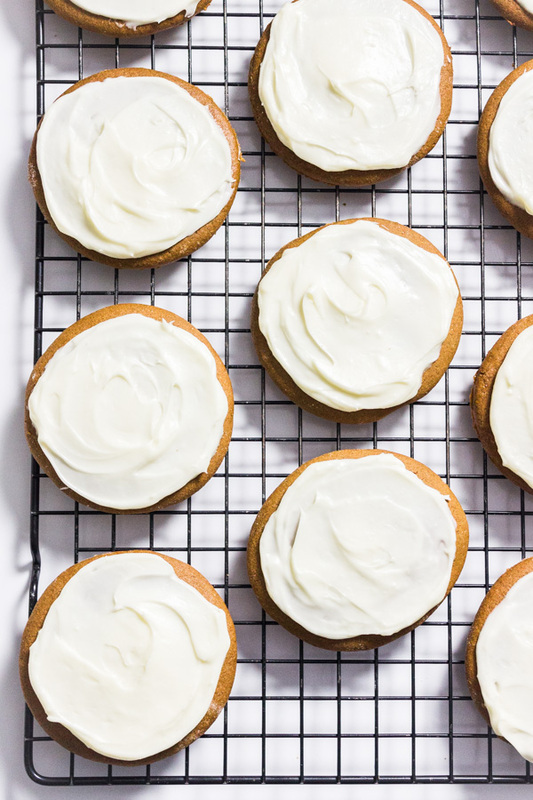 It’s dreamy cream cheese frosting and you should definitely slather a whole bunch of it right on top of your cookie. P.S.S. –> Dear Santa, since I know that you’ll like them more than the cookies you’ll be taste testing at other houses you’ll be visiting, this dutch oven is what I would like for Christmas this year. Just think of it as an upgrade from the Easy Bake Oven you never gave me as a kid. Here…have another cookie. 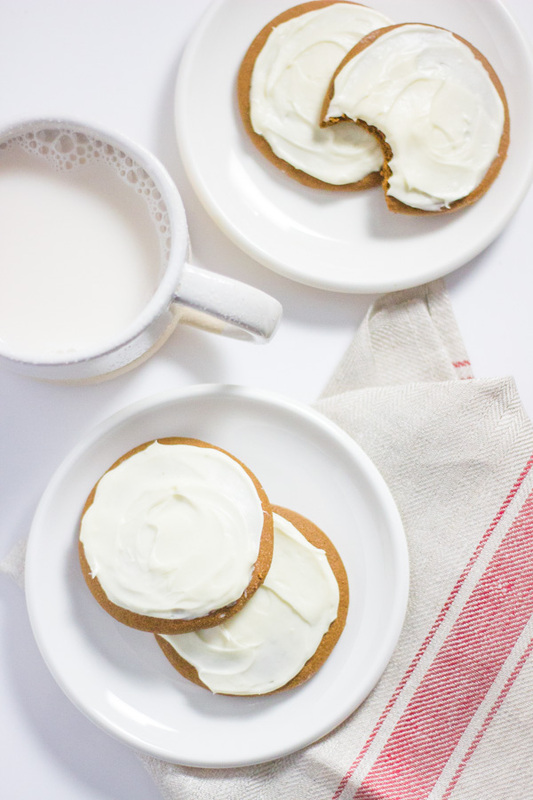 A soft and perfectly spiced gluten free gingerbread cookie topped with a dreamy cream cheese frosting. This is the gluten free holiday cookie you’ve been waiting for! 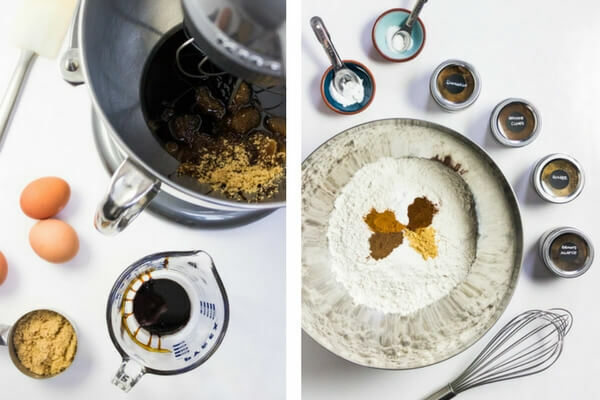 In an electric stand mixer fitted with a paddle attachment, mix together the olive oil, brown sugar, molasses, vanilla, and egg on medium-high until thoroughly incorporated. Meanwhile, combine all the dry ingredients in a medium mixing bowl. Whisk together until evenly combined. Returning to the stand mixer, turn the mixer on to low speed and slowly add the dry ingredients until just incorporated. Scrape down the sides of the bowl with a spatula and mix again to combine. Dough will be slightly sticky. Remove the bowl from the stand mixer, cover, and place in the refrigerator to chill for at least 1 hour. Once your cookie dough has chilled for a least 1 hour remove dough from the fridge. Preheat oven to 350°F. Line a baking sheet with parchment paper. On a lightly floured surface, roll out dough until about 1/8″ thick. 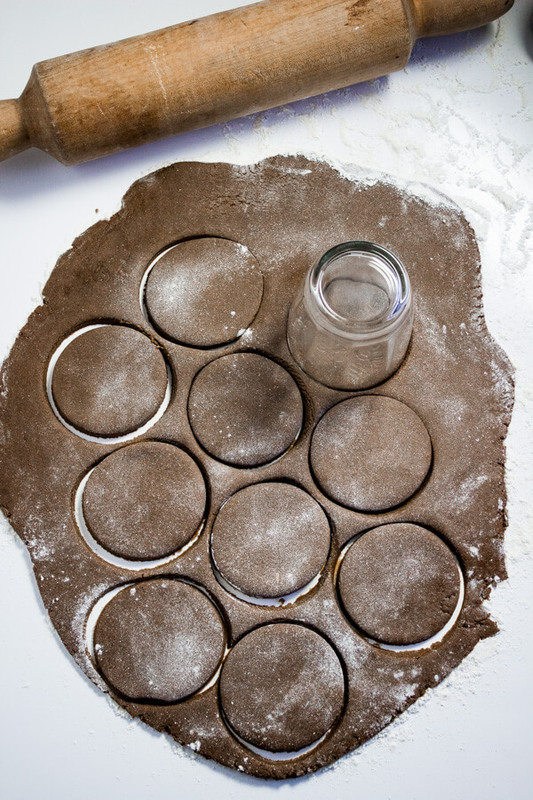 Using a 3″ round cookie cutter (or if you’re like me and don’t own a round cookie cutter use a drinking glass to cut out your circles, or if you’re super fancy and have cookie cutters in all the shapes use those too), cut out dough. Place on the prepared baking sheet. Lightly knead dough scraps together and then roll out again until all the dough has been used. Bake for 9-10 minutes. Allow to cool on the baking sheet for a couple of minutes before transferring to a cooling rack to cool completely. 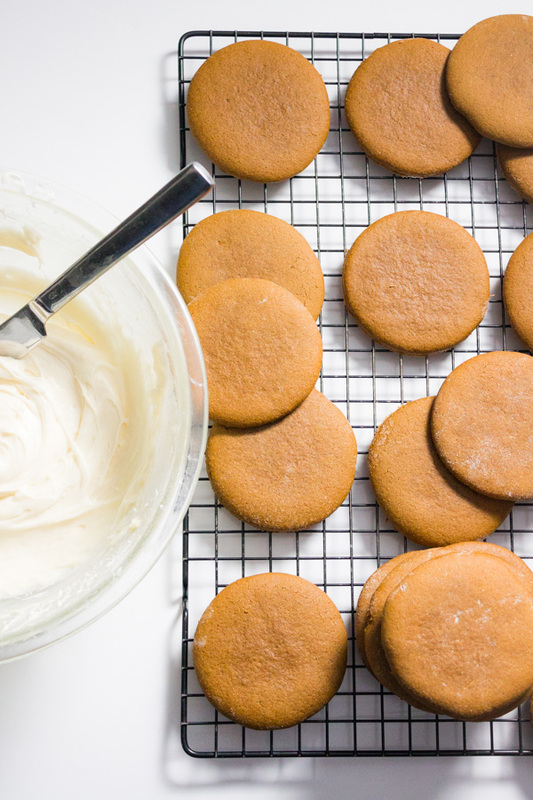 Once cookies have completely cooled, top them off with some dreamy cream cheese frosting! Lay out a plate of at least two cookies and a mug of cold milk for Santa. 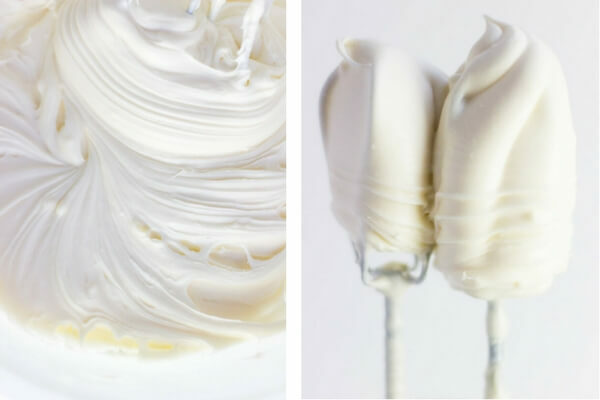 In a large bowl using a handheld or stand mixer fitted with a whisk attachment, beat the cream cheese and butter together on high speed until smooth and creamy. Add vanilla and salt. Turn mixer to low speed and slowly add confectioners sugar until completely incorporated. Turn mixer to high speed and beat for a couple more minutes. Total time does not include chill time for the cookie dough. 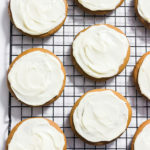 Nutritional information does not include the nutritional data for the cream cheese frosting since the amount of frosting you decide to put on your cookie is up to you! Plus we don’t really want to know the data on the frosting anyway, right? Nah. These are amazing. I used coconut oil instead and they came out great. Thanks so much for providing such wonderful recipes! Thanks Julianna! I’m so glad you were able to make these with what you had on hand! These were so yummy! I made a few alterations based on the ingredients I had on hand. I used melted butter in place of the oil; half GF flour, half Italian flour; and 1/4 tsp. cloves (personal preference). I didn’t have cream cheese, so I sprinkled them with organic sugar before baking. The dough keeps well in the fridge, which is handy for making smaller batches to go with my afternoon tea. 🙂 (I got lazy with the last batch and, instead of rolling them out, I rolled the dough into balls and pressed them with the bottom of a sugar-coated drinking glass. They turned out well!) Overall, a perfect holiday treat! Thank you!